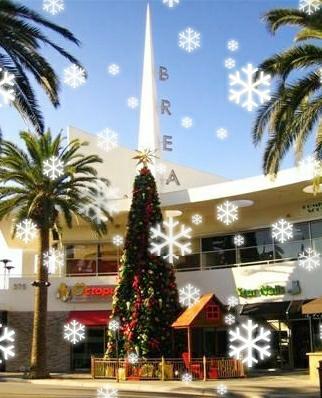 Brea, CA is a wonderful community located in Northern Orange County, it’s been home for my family for over thirty years. Downtown Brea at Birch Street, known also as the Birch St. Promenade is North of Imperial Hwy. and West of Brea Blvd. It’s a small area of town with shops, movie theaters, restaurants and little eateries. Summertime visitors can enjoy an outdoor concert, dining alfresco, a classic car show, or a wide variety of other events on Birch St. It’salways a fun place to be. At holiday time, many of us look forward to the giant ornaments on display at sidewalk location s this time of year. They’ve become a family favorite photo opportunity for personalized Christmas cards year after year. Or then again you can always find one of Santa’s “green” reindeer sitting on benches around town. And for most of us s living in Brea, we experience some of the bigger city benefits, yet while maintaining a small town atmosphere in many ways. Our award-winning schools have been a significant attraction to the community for many residents. Some of us remember earlier days in our community, when Brea Blvd. was just a small 2-lane road and was home to the infamous Sam’s Place, the local bar in town. I actually miss those days myself at times. It seemed like you couldn’t go anywhere without seeing someone you knew. Today Brea is known for many things including shopping. The Brea Mall is the second largest grossing (in sales) mall in Orange County, second only to South Coast Plaza. Revenue from the mall helps fund some of the city benefits. Lynda – your posts on Brea are always amazing, but I especially liked this one. Those gigantic ornaments are so much fun! Lynda, Brea looks so festive! The huge ornaments are so neat. Great photos!! Ines ~ Thanks for the visit, good hearing from you.